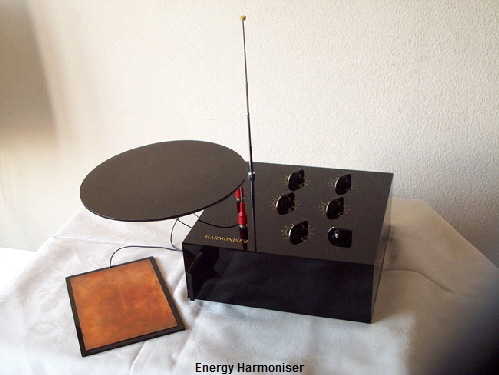 The Energy Harmoniser is a radionic instrument used for the harmonisation of adverse energies and electro-magnetic anomalies in places. These places may include homes, offices, factories and workshops as well as agricultural and horticultural settings, indoors or outdoors. It is recommended that the operator has some dowsing skills but otherwise a well developed intuition. Generally a dowsing pendulum would be used to set up and activated this radionic device. The Energy Harmoniser is portable and used to good effect on site or radionically at a distance. Expertly constructed in the traditional black-box design from quality materials, it does not require a normal battery or power source. The device is supplied with the required attachments for use in various modes together with simple instructions.